We're very pleased to announce another exciting new feature for our Premium members - a new option in the route planner to highlight roads and paths that are likely to be suitable for road/racing bikes. The new Road Bikeable map layer has been developed uniquely for plotaroute.com using surface and access permission data from the OpenStreetMap project. 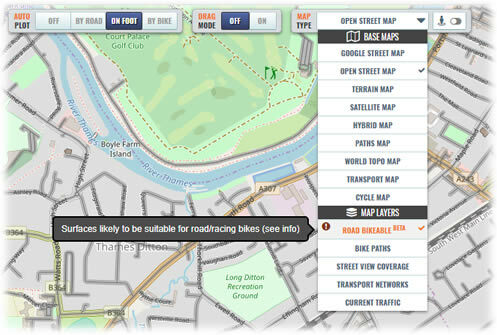 It is currently in BETA mode and coverage is still developing, but if you know of a road or path that is suitable for riding with a road bike that is not shown on the Road Bikeable map layer, you can update the attributes for this road or path yourself using the OpenStreetMap editor (see our guide on contributing to the Road Bikeable layer for more details). Any updates you make should normally appear on the Road Bikeable map layer on plotaroute.com within 7 days. Once the Road Bikeable map layer has been selected in the route planner, suitable roads and paths will be highlighted on the map in grey. You can then use this, together with other features available on plotaroute.com like Google Street View, when planning a new route for a bike that doesn't have off-road tyres. We've also taken the opportunity to simplify access to all map layers like this by combining them under one menu with all the base maps and we've made it easier to access the OSM Cycle Maps base map, by adding this as a new option. If you're currently a Standard member and would like to find out more about other features like the Road Bikeable map layer that are exclusively available under Premium membership, please visit our Membership Options page. Finally, we'd like to extend a special thank you to everyone for supporting the site over the last year and we wish you all a very happy and healthy 2019. Your link in the text do not work for me. Thanks for flagging this up Peter. The link should be working OK now. Does anyone who actually uses this site to plot cycle routes have any input to "features" you add that make the site more unusable? In fact you appeared to have excelled yourselves and removed the ability to overlay "bike paths" over anything other than Google maps. What was previously an extremely useful feature where you could see bike paths overlayed on OSM is gone. We haven't actually removed any features with this update - the Bike Paths layer was always only available with Google maps, as it isn't compatible with non-Google maps. Previously if you selected the Bike Paths layer while viewing an OSM based map we changed the map type to OSM Cycle maps. To make this less confusing we've now added OSM Cycle maps as a new base map option, so selecting this will display the OSM bike paths that you're referring to. I'm happy to look into the Street View issue that you mentioned if you can let me know the steps to consistently reproduce this. Obviously as I am just an ignorant user of this site, all I can do is tell it as it is. I have for many months happily selected "Paths Map" and then selected what was until today the additional overlay "Bike Paths" which would then render over the top of the "Paths Maps" cycle paths where they exist. How this was deleivered behind the scenes did not concern me. Even your own response confirms you have changed the way things work but you start your reply with the condescending "We haven't actually removed any features with this update"
I'm sorry you feel that way Trevor - we are only doing our best to improve the site. I'm afraid I don't see how there are more mouse clicks involved to access the OSM Cycle maps now than before this latest update. You can just select the Cycle maps from the Map Types list with one click whereas previously you would have to first change to the Paths map and then select the Bike Paths option. The changes also mean that the OSM Cycle map will be loaded by default (with no mouse clicks at all) if it was the last map type you used. This wasn't possible previously. We get a lot of requests for enhancements and have thousands of users so we try to take as much feedback into account as we can when making changes, but we recognise that it is not possible to please everyone all of the time. I can only apologise if you feel that these latest changes are a backward step. Sorry I must be wrong and you must be right. Obviously my use of this site does not match what you believe to be the only way that it should be used. I default to using Paths Maps because in the country I am currently this is by far and away the best map option, in some cities I will occassiionaly decide to overlay the cycle paths. That you now seem to acknowlege was always possible and remains possible. The lesson I have learnt today and hopefully anyone reading this who is considering upgrarding their membership, is that this is not a forum for feedback but one where users can expect the scorn of the site owner for questioning anything. I’m at a loss what to say Trevor. You can still toggle between the Paths map and the Cycle map if you wish - its only one mouse click to do this - so I’m really struggling to understand what you feel has been lost with this upgrade. Clearly you are unhappy so if you would rather cancel your membership let me know and I can arrange this. Apologies again for causing any problems.